Whenever you drive towards the outskirt of the city, you must have seen lot of desert camps and people enjoying. You too must have felt like joining a camp and enjoying camping in a Kuwait desert. Isn't it?? Desert Camping is an old Kuwaiti tradition.Each year, Kuwaiti residents retreat to the desert for the ultimate camping experience. The article Desert Camping in Kuwait from _The Kuwait Armed Forces Journal_ describes the need Kuwaitis feel to seek refuge in the sand as a traditional way to eliminate stress, stray from the mundane routine of daily life, and enjoy nature. In these camps,it is not uncommon to find five to ten small single pavilion tents, used as sleeping quarters, and two or three large family tents, used as the family gathering place. Two or three bathrooms are constructed out of an aluminum material and are detailed with cement floors, running water, flushing toilets and sinks. A kitchen is also constructed out of this same type of material, which may also include a gas stove and several storage compartments. The family gathering quarters contain satellite television, couches and carpets. Power comes from generators, often only run at night. Surrounding the entire camp are barriers of wooden poles with lights attached, dug up sand piles, and tires. These barriers are built to prevent unwanted cars and recreational vehicles from coming too near to the family camp. 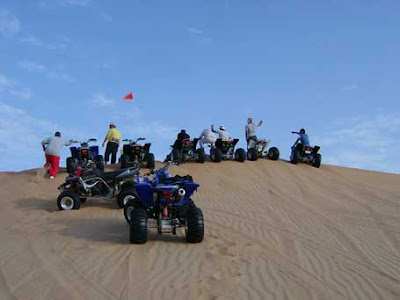 You can take part in horse riding, camel riding,play volleyball, basketball,fly kites,ride the buggy and have the ultimate camping experience. 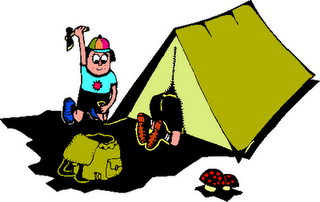 The official time for camping begins as of November and comes to a close late March. Anybody interested in Desert Camping should get in touch with Nuzha Touristic Enterprises. They offer camping over night in the desert or daytrip(s) for groups both during Weekdays and Weekends.